Why can't I see the files on a CD I created? - Ask Leo! When you can't see the files on a data disc you've created the causes can vary from exactly how you created that disc in the first place, to media quality, drive problems and even Windows Explorer settings. I have several discs on which I have stored media files when I had a Windows XP Pro PC. Now I’m using a laptop with Windows 7 and when I insert those discs in its CD drive, I cannot see any of the files. When I open my computer and look at the “G” drive, which I know is my CD drive, it says that there is data stored on these discs and how much room I have left, but when I open it, there are no files showing. Why is this? Good question. It depends a lot on exactly how you created that disc in the first place. That’s information that you didn’t give me and a lot of the times it’s as simple as not having used the right program, or having chosen the right format in the beginning when the disc was created. Unfortunately, I don’t necessarily know of a good way to recover from that. In general, Windows 7 should be able to read any disc that Windows XP has created. Put another way, if the disc worked originally and you could see the files in Windows XP after you created it, then I really don’t know of a format-related reason that Windows 7 wouldn’t be able to see those exact same files. One thing that comes to mind is that CD and DVD discs do wear out – or rather, they degrade over time. Now, normally, a degraded disc will more commonly show a different type of error. Specifically there will usually be CRC or other similar hardware related errors when you try to read the disc. CRC errors are the errors that usually show up when the disc starts to degrade over time. I know that’s not the error you’re reporting, but even so, it’s small a possibility here. You haven’t told me how long ago these discs were created and of course, what kind of media you used when you created them. If you used inexpensive media, or to put it even more bluntly, if you used cheap media, and perhaps are more than, say, 5 years old, that they’re actually starting to degrade. One thing to try is to try to read the disc in another machine. Particularly when discs just begin to show signs of degradation the slightly different alignment of different drives in other machines can often allow the disc to be read. In fact, taking the disc to another machine is just a good idea in general. The fact is that hardware can fail over time – anything dirt and dust in the mechanism to actual component failure could all lead up to the symptoms that you’re seeing. Taking the disc to another machine can help gather some clues – if it reads readily on the other machine, then perhaps it’s time to see if your disc reader is operating properly. One last thing I would have you do is to change the Windows Explorer settings to “see everything”, though admittedly this is also a bit of a long shot. In Windows Explorer go to the View menu, Folder options, and then in the View tab, there’s a long list of options. 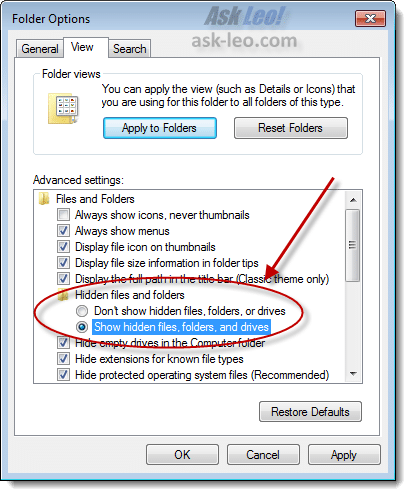 I’ve got a couple of articles on changing Windows Explorer settings that will actually show you where these settings are – but the bottom line is in there, select the option to “Show hidden files, folders and drives”. It’s possible that for some reason the files on this CD have somehow been marked as “hidden”. That actually would result in what you’re describing: what looks like an empty disc, because it’s not showing those hidden files, and yet the disc would still show as using space and having space available. How do I burn ISO files? - ISO files are often used to distribute images of CD and DVD data discs. I'll walk through how to burn ISO files to optical media using ImgBurn. « Previous post: Why Might an Update Take a Large Amount of Space? Leo, is it possible that the discs were not finalized? They might be fully usable on the computer that created them but not on Windows 7. If that is the case — and if possible — putting the cds back into the same environment that they were created in and finalizing might make them usable in the Windows 7 machine. Just a long shot but he has nothing to lose. Karl, that sounds like a possibility. I’ve had the same problem sometimes. I was able to read them on some computers but not others. So perhaps trying a few computers might yield one that can read it. There is another possible fix / reason for this problem. I used to work in an office that used a combination of Mac / Apple and PC’s computers. And we saved our client files on CD’s and sometimes they would come in in a panic because their files had disappeared when they tried to open them at home. The fix was as simple as putting the CD into the same type of computer it had been formatted on. If it had been burned on a Mac putting back into a Mac showed all the files and vice versa. This comment doesn’t negate any of the reasons/ solutions offered by LEO. i have burned CD as USB and putting my data on it usually but now i can not see my data on it although CD shows the space data ad taken from CD. please guide the quick solution data is important for me. I have the same problem as ahmad. I formatted the DVD to use as a USB and made the mistake of cutting and pasting files onto the DVD when I should’ve used the copy function. The files burned and I’m showing data present via the computer (space available is reduced on the DVD) and physically on the back of the DVD. I ‘closed the session’ but was unable to view the files afterwards. Is there a way to recover what is already burned to the disk? Should I reformat the DVD again? All done on Windows 7. Any help would be appreciated. You need to be aware that if you’re setting the CD to work like a USB drive that you will need an RW disc, otherwise writing/changing files will quickly degrade the CD until the files are no longer accessible. If you do not change or delete files and you just add files, you will probably be okay. Changing and deleting files on a -R/+R disc is going to result in weird issues and an inability to read the data. Personally, I never set up CDs this way because I don’t have RW discs available to me and because it is too easy to make mistakes thus causing the data to become corrupt or unreadable. To add to what I have already said, you need to read some of the previous comments because they talk about a CD not being finalized being inaccessible on different computers. A CD setup to act like a USB drive is not going to be finalized until you tell Windows to finalize it. Take it back to the original computer where it was burned and try to finalize the disc. You can google search this to find instructions, they’re probably everywhere. Also, you don’t want to reformat the disc (I’m pretty sure it wouldn’t be possible) because reformatting a CD is….well…without getting into it too deeply, it won’t work or fix something like that ever unless you have an RW disc. You’re better off trying a new CD. If you know what you want on your CD already and you don’t plan to add anything to it, try using the other option such that the CD doesn’t act like a USB drive. Add all your files and finalize the disc at once to ensure the best possible portability. So your solution, in summary, was a driver issue of your burner? Can you provide brand or model burner this solved the mystery of missing data on; say if it was on a ibm think pad then perhaps a big part of the community can solve it simple as that or as i ask later use a live usb boot os where sometimes drivers are more adequate and then trouble shoot your way from there or perhaps just make a copy of the disc if to archive on high quality cd or other disc media from that boot os. Hi Leo, can you please tell me why when I transfer my data from a CD back to a new Dell Laptop, the data has copied over but when completed I do not see any data . I have three CDs that I had restored from a bad Hard drive. Once I started to restore those three CD’s I could see the data transfer but when completed and When I open the folder, I do not see any data. I did go to Windows Explorer, View, Folder Options and click the view tab. The Show Hidden Files, Folders & drives is checked.. Please help so I can view my data I copied over. Unfortunately I’d have to know the complete and exact steps that were used to create the CDs and copy the data back. If you have that submit it to http://askleo.com/ask . when i am burning cd using windows 8.1 burning was success full. but i am unable to see the files what are the files i am burned. it showing only first time when i burned data. please give me the solution how to solve this problem. My laptop will not read an audio disk that I burnt on this laptop. I have this hard drive partitioned with windows 7 and ubuntu. . Windows can’t read it but ubuntu can. Any help would be appreciated. Thank you. Pretty much all of your available options are in the article you are commenting on. Unfortunately, it’s not always possible to recover the information on a faulty CD. Leo asked for burn method, or burn software use, which I didnt consider relevant but when Leo mentioned it Yes i immediately remembered that this is windows we are talking about (love it personally; but it absolutely has been love/hate relationship over the years and with every update driver error bsod and release along the journey. There are basically not really too many answers or followup solutions either: as in brand and ranking of the disc they burned on as there is a site i just cannot for the life of me find when i produced in the music business i would always use to give clients options to archive grades of the different cds offered. In the questions i asked, all i hope pertinent to this topic, was for some scenarios in which one whom has a cd they burned lets say for discussion sake around the years after October 25, 2001; 14 years ago and before October 22, 2009; 6 years ago (XP and win 7 release dates) has their shiny new OS installed pops in the their cd that has been in say a hard shell cd case in a well climate 200 cd box, and the auto play shows up one clicks explore disc and either nothing is shown there, with hidden objects checked to be seen, a disc that has been finalized, they responsibly ran there data verification at the nightmarish 2001 4x speeds all way good, the cd on physical inspection scratch free not dissolved transparent looking, and even the new os is showing out of 700mb say 300mb used…. but nothing shows up and… where is the data or what are some options do i have to recover or copy or extract that data to solve the problem… least that i interrupted the posted question… I think we are on the same page here right? my cd reads in my laptop.but,i cant able to see the files inside the cd.this happens only for my laptop.it runs in my tv and dvd player.i need to know,why it is happening?i want the solution. In my case DVD data is unable to view in win7, due to GPO changes in my offices, how can we rectify in local GPO. I have read all that you are posting but I have to same computer that im using my burned dvd rom on. My co puter got a virus and closed down mypc I got it back up and running in safe mode, and created the dvd rom to save files, now that I re installed windows 7 and try to open dvd rom it goes tomedia plyer o ly and I cant get it to go to any other program toopen it any suggestions? depending on the type of files you backed up, and assuming you verified the burn, and assuming you instead of listening to the auto play and good to my computer see that the disc space is taken up on the cd with respect to the amount of data u backed up, then find the cd in my computer and open it to view the files not to open media player, can u see the files there? if they are mkv – avi’s ect. remember depending on the length you had the computer the different possible users of it and all those variables, it indeed it was digital media content as opposed to excel spread sheets and the likes as you did say dvd (lets assume it is a simple single layer what 4.7gb i think dvd disc considering the variables present with what most have had throughout their computing experienced the entire odd R or RW + and – to DL conundrums *esp. if u ever had fun with mr xbox and including the speed 4x 16x 32x what not along with the burner speed ect) in your situation you you may need to install video codecs as if i understood correctly you did a clean wipe of your hdd or installed a new viri free one and reinstalled the os, as leo mentioned trying it on a different dvd player or computer may fix it then you need to dig into issues of firmware as one poster mentioned drivers and finding driver updates (which there were a lot of fixes from floppy to 100+ gb blu disc and the capability along the way that might be a simple fix. i really cannot suggest driver pack sol LEO would need to chime in on if he trust or uses it or recommends it or whether or not ur using a laptop or pc and need to disassemble or attach a plug in play external read and see if that solves it (I am hoping LEO reads my post and finds a good site that the more generic the better that list power and quality of burners and compact disk rankings for professional and commercial use as well as a consumer comparable one, then perhaps you may know your player is just kinda jacked.) Not really helpful i know, but depending on what u backed up and if u list or mention a few of the variables i mentioned here perhaps a solution will quickly come up. I grew up knowing with windows that is; that unless lighting frys it or its put in a microwave there usually is a way to recover if done correctly but as true as that is theres the low percent of systemic failure that u may have encountered: ur viri situation def makes the response more difficult as to how u found ur self down that ally is a matter worth elaborating on abit more as well. good luck. keep solutions and when resolutions are reached posted – to give back! I wrote first and will state my questions here in order with summary as to what i mean at the end for sake of you. 1) is there any program or forensic OS (ex windows, mint, total commander boot, glary utilities, linx boot, liveusb boot acronis or otherwise) which you could suggest to view the data on these countless cd’s, that now on windows 10 even shows there is data but when opened says is empty as well as the good ole look and can see there is data on it? (AS this forum post is about) . 2) I have hypothesis that is at best anecdotal, that writing on a disc with a sharpie or permanent marker results in longer term destruction of a disc, is that a possibility? 3) Do you know of any hardware cd/dvd/blu ray burners readers each any or all, that have an extremely high rating (as well as a site u goto b4 you personally buy products; that gives honest quality reporting) such as great lasers with the specific quality of a hardware’s ability to read a disc that may be readable but somewhat suffering degradation or damaged but could still pull or extract some of the data to the best of ones chance at recovery, as this post refers to? 4) it has been a while, but i know there is a very simple techie website, i cannot find that listed and ranked all cd’s by their Archie worthiness to those that are junk by fair honest ratings by info such as longevity ect. Do you have any ideas u can think of what might be that site? 5) Do you know of any powerful burner or reader or computer less cd cloner with great reviews, or a site that ranks burners and such in terms of lazer quality ect and ranks them accordingly. (Almost feel like an auctioned gov site of a previously used model for some forensics lab would be best option; so either commercial or consumer cd hardware readers if such hardware exist do you know of any?) in order to have the best chance to at least back up the data that is not showing? or if u know off the top of your head a great one to try out there? 6)Next, do you recommend, out side of the tradition microfiber and alcohol cleaning option of ALWAYS from center to end never circular, cleaning tips or hardware systems: such as a cd machine that can take if commercial grade a spindle and just automate a safe maybe ultrasonic system to clean cds with out harming them, again for the best chance of data recovery either a hardware that cleans them one at a time consumer grade or professional grade cleaner hardware soultion? or perhaps a mailout service, firm or company that provides this option? or is the microfiber cleaning disc y disc basically the only option? I tried to be direct and specific, if u feel the need i believe u can cut below here if u edit or keep my question post and have some amazing answers if indeed you have them that may end up helping what has to be 1000’s of people with this very issue (i know most prob toss their old cd’s that could simply have been booted by pen drive and had the problem solved, if indeed u have a suggestion on that. Thanks LEO! I, now on win 10, have come across this issue of simply looking at the disc seeing the burn on it so I know it is written and when written as habit always finalized. I have ZERO confidence in WIN 10 and its validity of if or if not there is data on a disc: for whatever reason. Now my question, relevancy addressed, is there any such program or forensic OS, be it windows or mint or even total commander boot or glary utilities, or a linx boot in which you could suggest in order to view, what sometimes on win 10 even shows as taken space but when looked at there is no data to be found all t’s crossed and i’s dotted on hidden settings ect, so one could view the data on these countless cd’s? Any ideas, suggestions, comments on the matter which is still relevant would be much helpful and appreciated. To boot, (not said as a naturalized us citizen born in Canadian i assure you?!!? or a pun master of computer jokes) is there any hardware or specific cd or dvd or blu ray specific hardware that has a extremely high rating in terms of great lasers and an ability to read the disc that are more on the damaged side but perhaps have extract able data on these cd’s this post refers to? That is a question that I have always pondered never really able to find an answer. Next Question I will repost all in 123 order after finished asking in full, there was a website that i cannot for the life of me find. A great nerd website that listed and ranked all cd’s from Archie worthy to junk by longevity ect. any ideas u can think of what might be that site? i know verbatim, a certain code one was ranked very high in archive quality along with gold ones. Do you know that website or a similar one? Next, do you know a website for the most powerful in terms of lazer quality with minimal coasters and tremendous readability and rank them accordingly. (Almost feel like a auction gov site previously used model for forensics would be best so either commercial or consumer reader) in order to have the best chance at this back up process i am undertaking here. Next, do you recommend, out side of the tradition microfiber and alcohol cleaning option ALWAYS from center to end never circular, cleaning systems: for what would be the ultrasonic cleaner is to a jeweler, a cd machine that can take preferably again possibly commercial grade products that clean cds with out harm again for the best chance of data recovery? or a service or firm or company that would provide this option? or is the traditional method pretty much the only option? i have gone under the task of attempting to back up all bout 29k of them (Yes, I had was one of a very few amount of people to have a burner in well the entire northwest and middle earth america as well as direct access to a facility that sold the disc actually recently i watch a how stuff works on making cds and it was just fascinating because i kept being like see that , i know that, and annoying everyone further [aka the lady of the house] whom likely didnt want to watch it to begin with.) So i am familiar with burnt disc vs degrading disc vs straight out toasted coasters. Obviously, old nero was the go to i think roughly version 7 ultimate but cant say with certainty. LocalizedResourceName=@%SystemRoot%\system32\shell32.dll,-21815 what does it mean? I can not open the files on my disk. I’d need a HECK of a lot more context on where you’re seeing this, why or how it’s a problem, and … ultimately … what causes you to ask? It has been a year since the last post on this topic, but I see this as additional inform. What I just learned has important implications as I have many back up data discs that were recorded on my old WinXP machine. It scares me that I may not be able to read them in the future. (1) I wrote data to CD-R using a WinXP pro machine.. It consists of Word file and an Excel file. (2) I have two WinXP-pro machines, two Win7-pro machines and one Win10 machines. (3) The data can be read on either WinXP machines. (4) One Win7 machine doesn’t even recognize that there is a disc in the drive. (5) One Win7 machine recognizes there is a disc, but says it has no space left on it. (6) I don’t remember the issue with the Win10 machine, but it did not show any data on the disc. (7) I have at least two WinXP-pro recorded CD-R data discs can easily be read on my Win7 machines. The CD-R that is only readable on WinXP machines is a Kodak 52x, while the others are Memorex, but I don’t think that is the issue. I can not browse my cd photos as it opens in photo shop express only ( uncalled for). I can not view the pictures fast and from edge to edge of the monitor screen. I want to delete or uninstall the photo shop express from my computer. How to do it please. I’m n not sure if this is the problem you are having. This article explains ho to change the default program for running programs according to their file extensions. I had just two days ago I burned some files on a CD RW disc. I added a few more files to the same disc but it said it has a very few space left on the disc, but I added it anyway. The next thing I do not see my burned files on a disc. It is from the attached files erased my burned files on disc. I can not find them. Is there a way I can recover my data I burned on the CD RW disc. I want those files back . I do have the checked the show hidden files and icons . No way to be sure, but from my experience, adding files to a CD or DVD can sometimes be problematic. Trying to burn more files than the disc could hold might have caused it, although the burning program should have blocked it. It might be that by ignoring that warning you overrode the protection. Quick question when putting a CD in a laptop and on the screen to see contents it shows the date, time, file size on JPEG, Is all this information correct, once Displayed and opened? Could it be my HP laptop, with Windows 10 have JPEG? Cd was created from JPEG , I’m learning, so you know I didn’t create this, I’m so confused! JPEG is a file format for photos. It has nothing to do with the computer you are viewing it on. There’s no reason for that file information to be incorrect.